Designed specifically for neonates and incorporates the BD Autoguard™ needle shielding technology. The FEP polymer catheter material features a thin wall design and a tapered tip that is designed to provide smooth insertion and optimal flow rates. 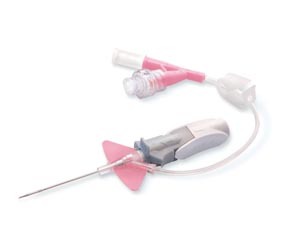 The unique BD Instaflash™ needle technology in the 20, 22 and 24 gauge sizes provides immediate confirmation of vessel entry along the catheter shaft. 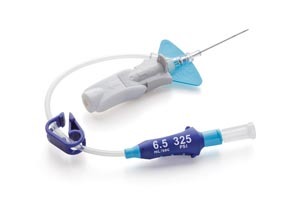 Combines the BD Autoguard™ needle shielding technology with the name you trust in IV catheters. The FEP polymer catheter material features a thin wall design and a tapered tip that is designed to provide smooth insertion and optimal flow rates. 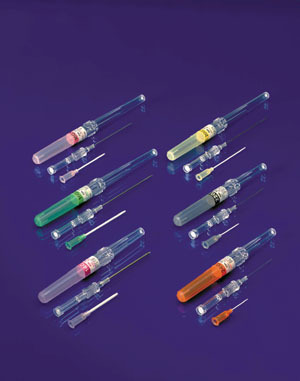 The unique BD Instaflash™ needle technology in the 20, 22 and 24 gauge sizes provides immediate confirmation of vessel entry along the catheter shaft. Shielded I.V. catheter made of FEP polymer. Designed specifically for neonates and incorporate the patented BD Autoguard™ shielding technology. 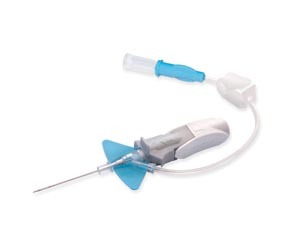 The unique BD Instaflash™ needle technology provides immediate confirmation of vessel entry along the catheter shaft. Made of clinically proven BD Vialon™ biomaterial. A study showed that one hospital reduced its needlestick injuries by 95% by switching to BD Autoguard™ needle shielding technology. 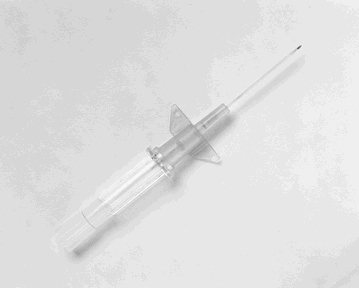 The unique BD Instaflash™ needle technology in the 20, 22 and 24 gauge sizes provides immediate confirmation of vessel entry along the catheter shaft. Made of clinically proven BD Vialon™ biomaterial. Specifically designed for use with the Interlink® injection site. It can also be used with Abbott LifeShield® and B. Braun Safeline® sites. A pre-assembled system that creates a closed single lumen fluid path, designed to minimize blood leakage from the catheter hub, and the potential for contamination and exposure to blood. A second port allows for simultaneous administration of compatible fluids and medications near the insertion site. The integrated, soft, flexible stabilization platform is designed for stability and comfort, and to minimize catheter movement in the vessel, as well as irritation to the vessel. Made of clinically proven BD Vialon™ biomaterial. 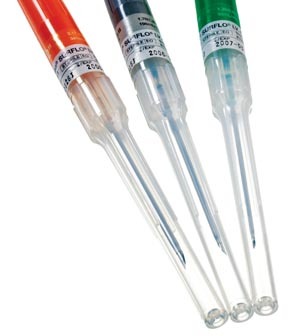 Combines needlestick safety with a closed system design. Designed for virtually bloodless procedure and greater safety for you. Made of clinically proven BD Vialon™ biomaterial. Latex free. Wingless. Radiopaque teflon. Offers passive safety technology and the comfortable feel of a conventional catheter with a smooth, tapered hub for insertion ease and patient comfort. 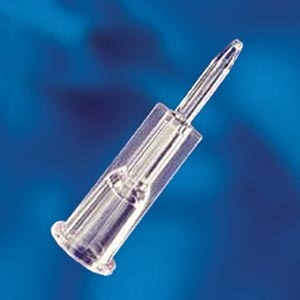 The unique, large-volume chamber allows clear flashback and easy handling, while the removable flash plug allows syringe attachment for special procedures. 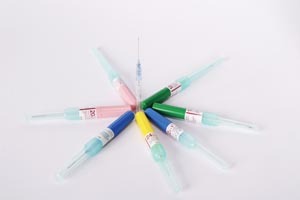 Passive safety technology help reduce the incidence of accidental needlesticks. 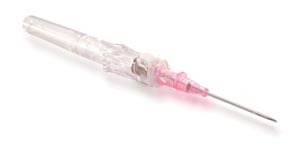 Minimal change in technique and no extra steps - simply insert, then thread, remove the introducer. . .the needle is blunt. Comfortable ""feel"" of a conventional catheter. Compact size and sleek profile allow for easy one-or two-handed insertions. Smooth, tapered hub for insertion ease and patient comfort. Availability in catheter lengths up to 2"" and in 14- to 24-gauge sizes. 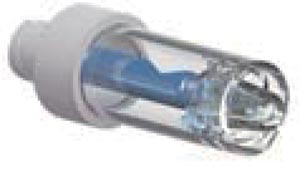 Unique, large-volume chamber allows for fast, clear flashback and easy handling. 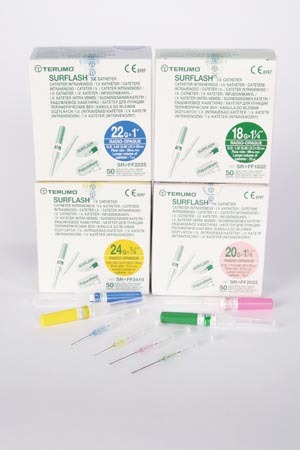 Removable flash plug allows syringe attachment for special procedures. 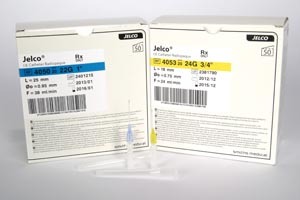 Offers all the features and quality of the JELCO® I.V. Catheter combined with the added feature of a metal hub, allowing for optimal balance, weight and suturing. Made of clear non-radiopaque, radiopaque, or striped radiopaque FEP polymer, which gives you the precise and confident feel of metal. Suture rings for additional securement. Translucent construction allows for consistent and easy flashback visualization. Self-venting removable flash plug. Finely tapered catheter tip eases insertions to minimize tissue trauma. Thinwall catheter design provides higher flow rates than standard wall catheters, often allowing for the use of a smaller gauge device. Kits include: portal, catheter, Port-A-Cath® straight needle, blunt needle, vein pick, and Point-Lok® device. Trays include: portal, catheter, Port-A-Cath® straight needle, blunt needle (except preassemble systems), vein pick, 18G extra thin wall introducer needle, ""J"" guidewire(s), vessel dilator/sheath introducer assembly, 90° Port-A-Cath® needle, Gripper Plus® Power P.A.C. safety needle(s), 2 syringes, tunneling tool, Cath-Finder® catheter/sensor assembly, and 6 ft sterile locator-wand cover. All systems are unassembled, unless otherwise noted. The leading standard peripheral I.V. catheter. The FEP polymer construction and ""J""-point needle design allow clinicians to easily feel the vein entry. 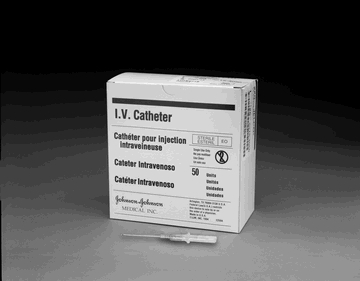 Clinician rely on these catheters for their ease of use starting arterial lines and gaining I.V. access. The thin wall catheter design provides higher flow rates than standard wall catheters, often allowing for use in a smaller gauge device. For enhanced securement, try the winged catheter. The flexible wings follow the contours of any site allowing a more secure attachment on even the most active patients. Kits include: portal, catheter, Port-A-Cath® straight needle, blunt needle, vein pick, and Point-Lok® device. Trays include: portal, catheter, Port-A-Cath® straight needle, blunt needle (except preassemble systems), vein pick, 18G extra thin wall introducer needle, ""J"" guidewire(s), vessel dilator/sheath introducer assembly, 90° Port-A-Cath® needle, Gripper Plus® Power P.A.C. safety needle(s), 2 syringes, tunneling tool and Point-Lok® device(s). All systems are unassembled, unless otherwise noted. 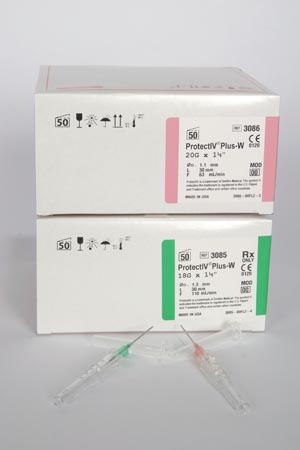 The Protectiv® series of catheters pioneered the movement to innovative safety design that protect the healthcare worker from the risks associated with accidental needlestick injuries. Choice of catheter materials, FEP polymer or radiopaque polyurethane, and needlepoint design eases conversion to safety catheters. 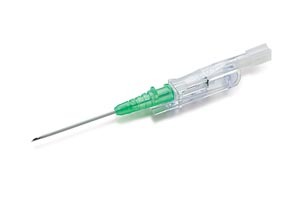 Unique V-point needle and advanced catheter tip provide for ultrasmooth insertions. Push-off tab facilitates one-handed threading; helps you keep both hands behind the needle until it is safely locked within the needle guard. Optically clear yet radiopaque Ocrilon® polyurethane is shown to reduce infusion-related phlebitis, allowing longer indwelling. A reassuring ""click"" confirms the needle is safely locked within the needle guard. 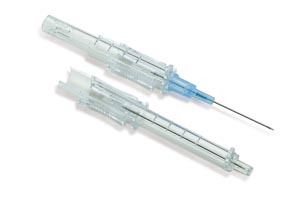 Built-in needle guard securely encases the entire needle to reduce needlestick injuries. 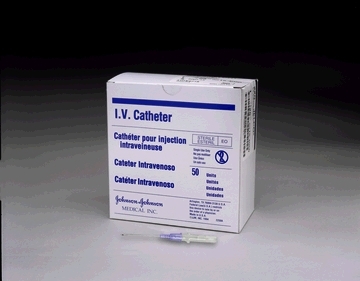 ViaValve™ Safety IV Catheter provides blood control to help reduce the risk of blood exposure and contamination. A unique valve inside the catheter hub impeded blood flow from the patient's vein upon initial venipuncture. Maintaining a clean access site, helps prevent the transfer of bloodborne pathogens from patient to caregiver. An ultra-sharp double-bevel introducer needle plus a medical grade lubricant allow for easier penetration and smoother travel through tissue. Preview chamber in clear sure-grip hub gives immediate indication of proper placement. Flexible catheter with large inner diameter assures good blood flow. All this plus safe, easy-to-handle, tamper-evident packaging. Kadiri Health, LLC has established itself in the healthcare industry as an innovative, cutting edge organization dedicated to streamlining the supply chain to lower cost to our customers. We provide over 80,000 products to acute care hospitals health systems, Integrated Delivery Networks, Group Purchasing Organizations, federal, state and regional governments and abroad. ©Copyright 2019 Kadiri Health, LLC. All Rights Reserved.